Did you know that Morocco has ancient Roman ruins? We didn’t either. 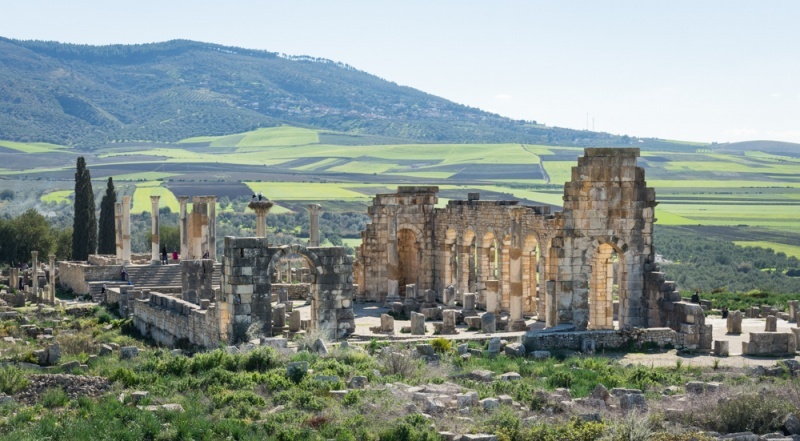 But just 30 minutes north of Meknes, near the religious city of Moulay Idriss, sits the well-preserved archaeological site of Volubilis. These well-preserved ruins seem almost out of place as they are seemingly in the middle of nowhere and surrounded by lush farm land. You must see them for yourself! 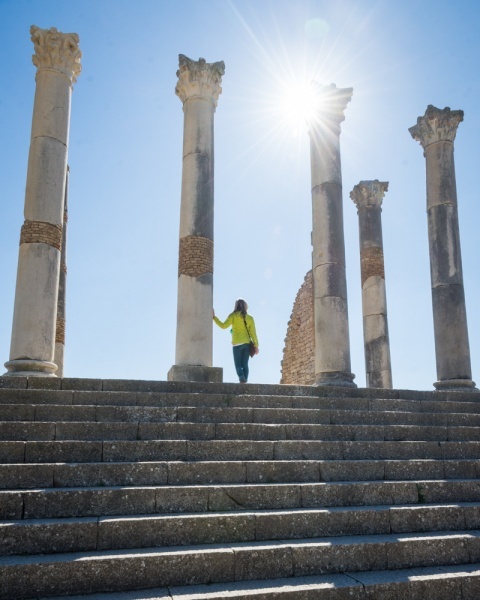 Declared a UNESCO World Heritage Site in 1997, the Roman city of Volubilis likely had around 20,000 inhabitants at its peak in the 2nd century. Today it contains one of the finest Roman basilicas in Africa and is well know for it’s vibrantly colored floor mosaics. 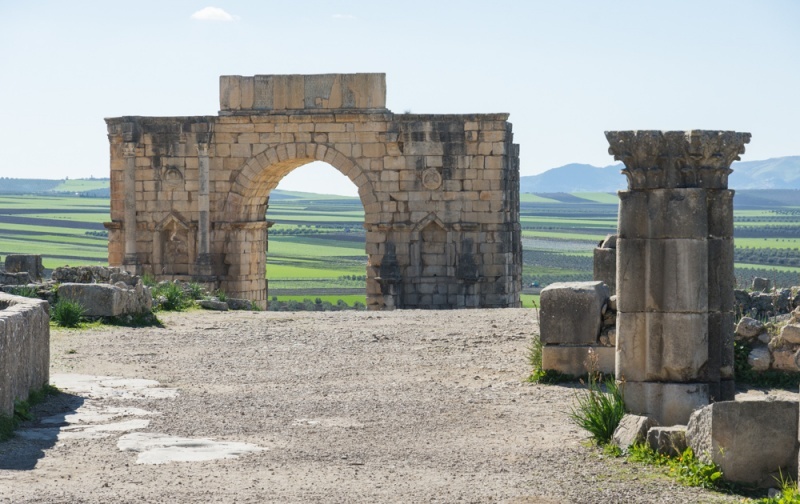 Volubilis can easily be reached as a day trip from either Fes or Meknes. And while most tourists arrive as part of an organized tour, it is actually quite simple to get there on your own via train and shared taxis (called “grand taxis”). This provides you the flexibility to see Volubilis at your own pace and to combine it with a visit to nearby Moulay Idriss which is one of the holiest cities in all of Morocco! If you are beginning your trip from Fes, the first step of your journey will be to get to the ancient city of Meknes. The easiest way to do this is to catch the train. 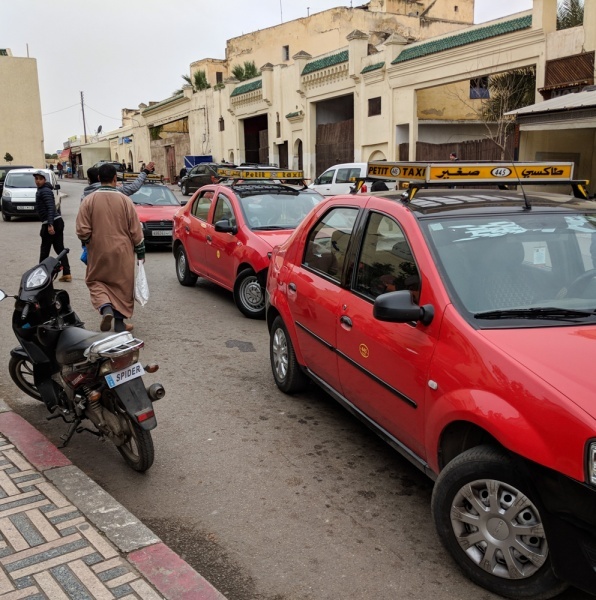 A “petite taxi” from the old medina of Fes to the train station should cost about 15-20 Dhs (~$1.50 – 2.00 USD). Trains in Morocco are both comfortable and punctual. You can purchase tickets either at the ticket counter or from the self-service kiosks which have menus in Arabic and French and are surprisingly easy to use. An employee is usually standing nearby to help. At the time of writing (February 2018) a ticket from Fes to Meknes cost 22 Dhs (~$2.50 USD) for a second class seat and 32 Dhs (~$3.50 USD) for first class. First class cabins have 6 seats (3 on each side) and your seat would be assigned when you purchase your ticket. Second class has 8 seats per cabin (4 on each side) and seats are first-come-first-served. The cabins are often very crowded so if you arrive late you may need to stand for the duration of the journey. The distance from Fes to Meknes by train is 33 miles and the ride takes just under an hour. Trains depart every hour and you can check the train schedule (and current ticket prices) on the official Moroccan Railway website. Petite taxis are small and can seat 3 passengers comfortably. They are used for trips around the city and run on a meter (be sure to confirm that they’ll turn on the meter before you agree to a ride). You’ll rarely pay more than 30 Dhs (~$3.00 USD) but you may have to share it as they will pick up additional passengers along the way. They are easy to identify because in any particular city they will all be the same color, but the color varies from city to city. In Fez they are red and in Meknes they are light blue. Grand taxis on the other hand are larger cars or minivans and they make longer distance trips. Each seat has a fixed price and the grand taxi departs when it has been filled with 6 people (plus the driver). If you fit 6 passengers in a minivan it’s no problem but 6 passengers in a regular car means that they put 4 people in the backseat and 2 people in the passenger seat. If you are a larger person or just like your personal space, consider purchasing 2 seats. The next step of your journey will be to travel from Meknes to Moulay Idriss. However, if you have some extra time we would highly recommend spending a day or two in Meknes. It is a wonderful city to explore! If you don’t spend some time in the city, you’ll want to make your way from the train station to the Jardin d’Amour. This is the park where grand taxis depart for Moulay Idriss. It’s only about 1.6 miles so you can walk if you’re feeling spry but a petite taxi should only cost you about 10 Dhs (~$1.00 USD). On the southwest corner of the Jardin d’Amour park you’ll see several grand taxis and a lot of people milling about. 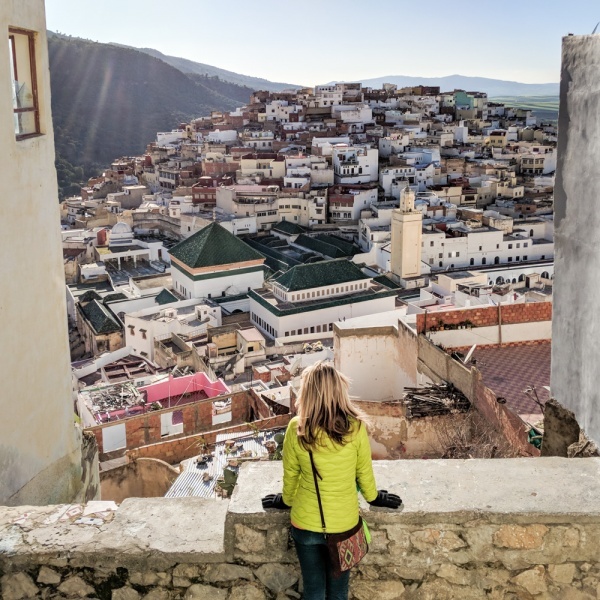 You’ll likely be approached by one of the attendants asking if you are going to Moulay Idriss. It is the major tourist destination serviced by this grand taxi point so you’ll have no problem finding someone to help you. The price of one seat in a grand taxi for the 30-minute ride to Moulay Idriss is 10 Dhs (~$1.00 USD). You may also be approached by someone offering to take you all the way to Volubilis, wait for you for a few hours, and then return to Meknes for a price of 250-300 Dhs (~$25-30 USD). Significantly more expensive but also more convenient if you are in a hurry. 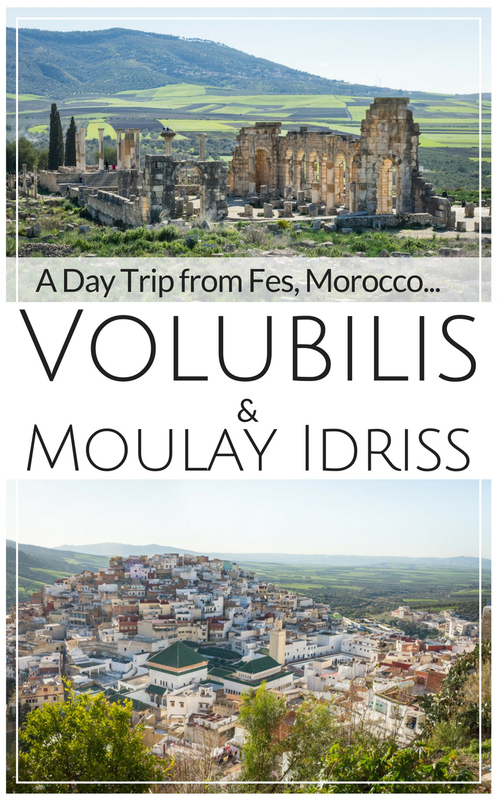 When you arrive in Moulay Idriss you’re just 2.5 miles away from Volubilis. You can choose to walk to the ruins or you can catch a private taxi for 20-30 Dhs depending on your negotiation skills. There should be a plethora of taxis waiting in the lot where your grand taxi from Meknes drops you off. Your driver will probably try to talk you into a round trip fare where they will wait ~1 hour for you to visit the ruins. You shouldn’t have any trouble finding a taxi back to town once you’ve finished. And even if you don’t, the walk back is manageable. So it’s not really worth their time or the extra fare. 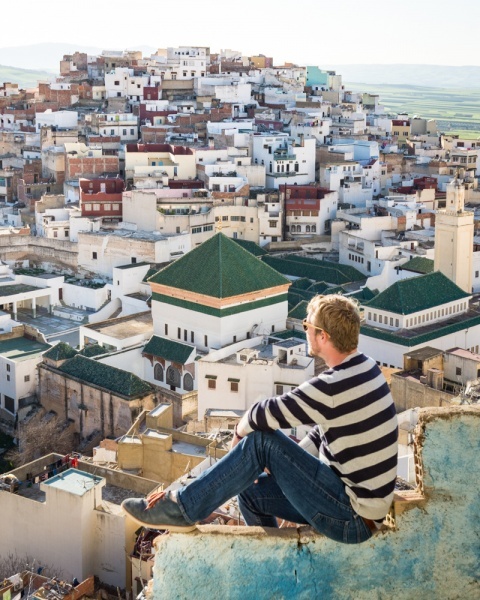 Be sure to spend some time in Moulay Idriss either before or after visiting Volubilis. It is a darling little town with scenic viewpoints, delicious food, and a lively central square that is perfect for people watching! Read more about what to see and do here below. Adults will pay 10 Dhs to enter the site and children under 12 years will pay 3 Dhs. Open 7 days/week from 8:30am until an hour before sunset. 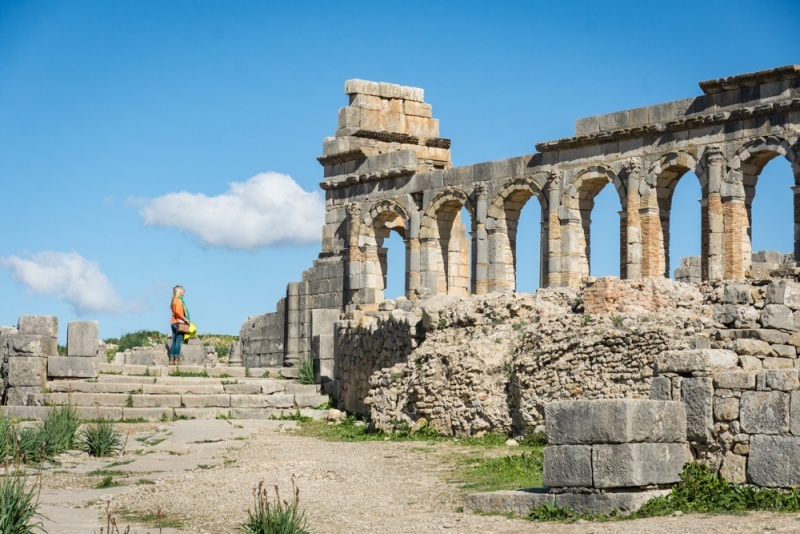 While the area around Volubilis has been inhabited for over 5,000 years, these ruined buildings were constructed after the fall of Carthage in 146 BC when the kingdom of Mauretania came under Roman rule. Volubilis was subsequently established as the royal capital of the state and became one of the wealthiest cities in Mauretania. The end of Volubilis as a Roman city began in 280 AD as Roman rule collapsed in Mauretania, and finally ended with an earthquake in the 4th century. Parts of Volubilus continued to be inhabited up until the 14th century and this was where Moulay Idriss established the mighty Idrisid dynasty of Morocco. Once the mighty city of Volubilis was finally deserted, the name and history of the city were forgotten. The local people came to believe it was built by ancient Egyptians and called it “Ksar Faraoun”, or “the Pharaoh’s Castle”. The remains of the abandoned city were ransacked during the 17th century and building materials were carried south for the new imperial capital of Meknes. Finally, an earthquake in 1755 destroyed what was left of Volubilus. 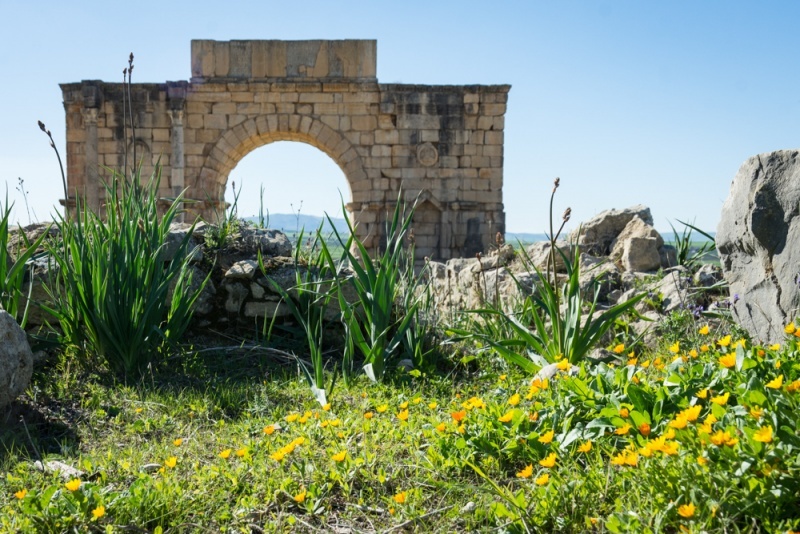 The first excavations at Volubilis began in 1887 by the French archaeologist Henri de la Martinière and hundreds of excavations have continued over the years to the present day. If you visit the Archaeological Museum in Rabat you’ll find many of the artifacts found during these excavations on display. 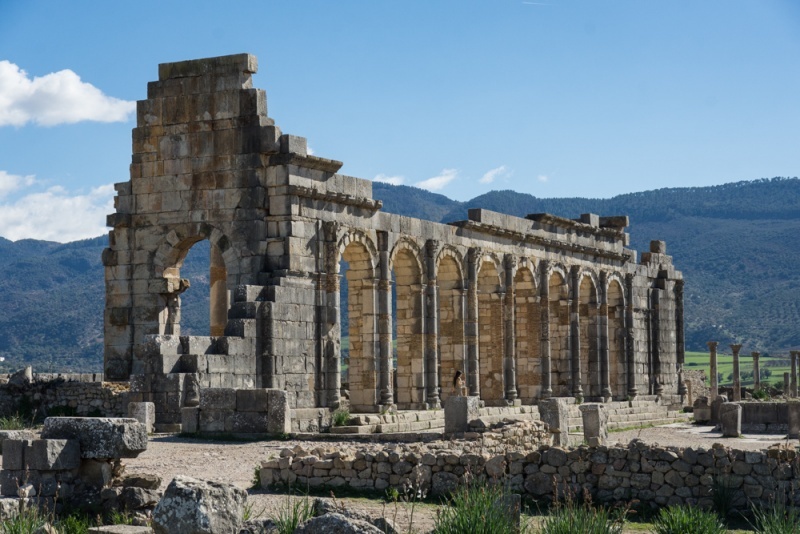 And while a few of the buildings have been reconstructed – the basilica, the capitoline temple, and the triumphal arch – over half of Volubilis still remains unexcavated. 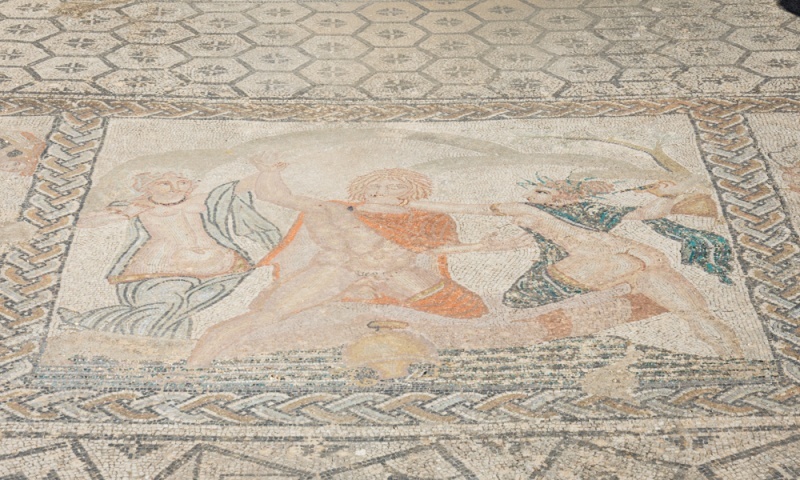 Don’t Miss These Volubilis Highlights! Completed during the early 3rd century, the basilica was used for governing the city and administering justice. It was reconstructed in 1965 and now consists of a row of tall arches and provides a striking centerpiece for the ruins. Dedicated to Jupiter, Juno and Minerva, the temple was first restored in 1955 with additional work being done in 1962. You can climb the 13 steps to the raised platform surrounded by massive Corinthian columns. Towering high above the ruins you can’t miss the Triumphal Arch. It sits at the western end of the Decumanus Maximus – a wide main street flanked on both sides by the remnants of the mansions of the city’s elite – and overlooks the fertile plains below. The arch was built in 217 to honor the emperor Caracalla and his mother Julia Domna (but sadly they were both murdered before the arch was completed). 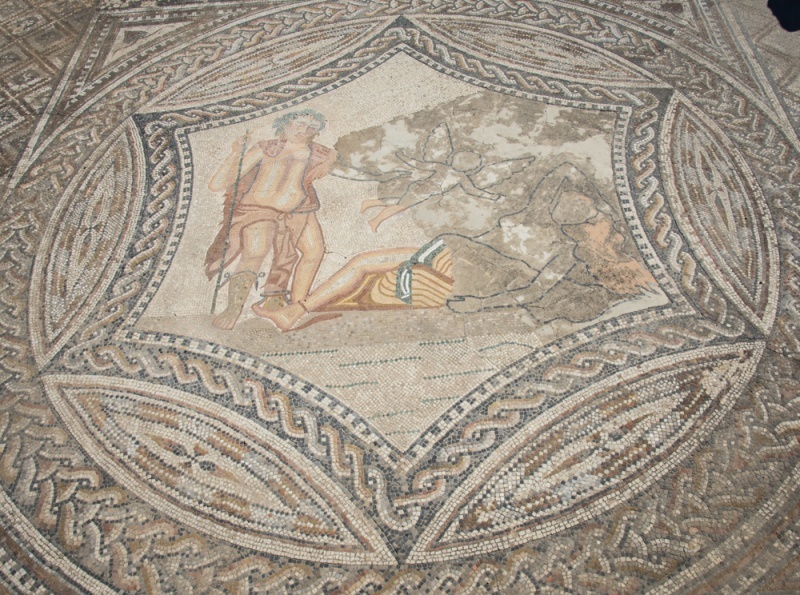 Here you’ll find a lovely and well-preserved mosaic that depicts (you guessed it!) the 12 Labors of Hercules. 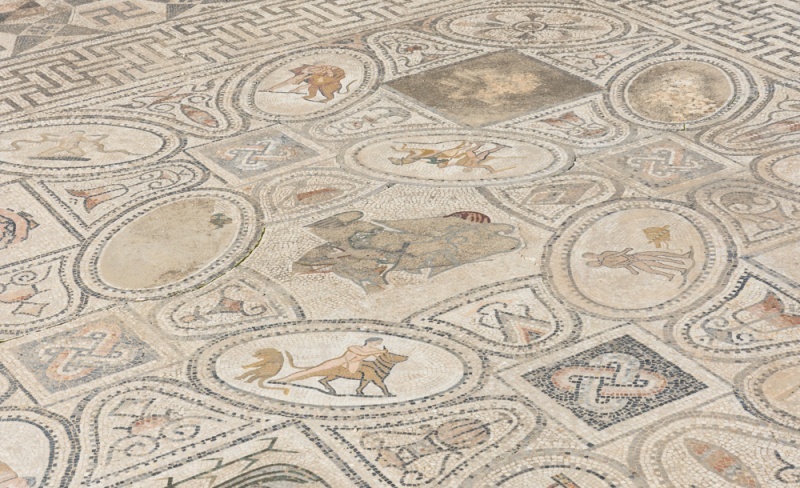 This was once one of the most opulent houses in Volubilis. 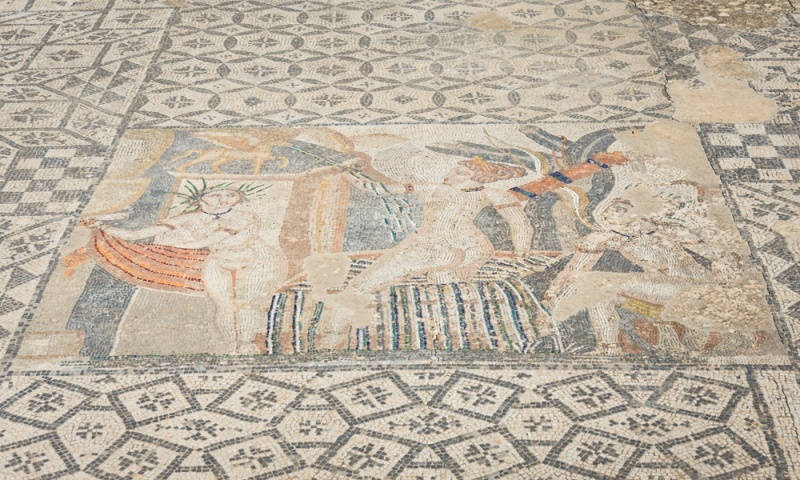 And while the mosaic of Venus that gave this house its name is now located in a museum in Tangier, you will still find two beautiful mosaics that can be easily viewed from the walking path. 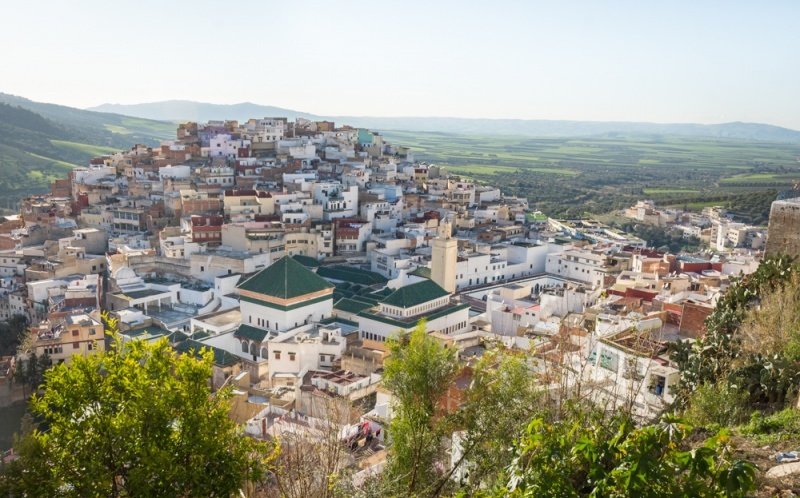 Moulay Idriss is considered to be the holiest city in all of Morocco. In fact, until 2005, non-Muslims were not allowed to stay overnight in the city. These days you’ll find it quite welcoming, regardless of your beliefs. Every summer the city hosts the religious festival of Mousseum which consists of music and dancing. Mousseum is one of the largest religious festivals in all of Morocco and some Muslims believe that attending the festival is an alternative to a pilgrimage to Mecca. The central point of all of this religious zeal is the mausoleum of Moulay Idriss. Moulay Idriss el Akhbar was a descendant of the Prophet Muhammad and born heir to the caliphate of Damascus. He was forced to flee civil war and ended up in Morocco. Once settled he began converting the then pagan Berber tribes of Morocco to Islam. He gained power and built the city that is now his namesake as the capital of his future dynasty. Five years later, in 792, the Umayyads (the victors of the civil war back in Damascus) had Moulay Idriss poisoned. His son Idriss II carried on his legacy and unified the region under the Idriss Dynasty – the first Arab Dynasty of Morocco. 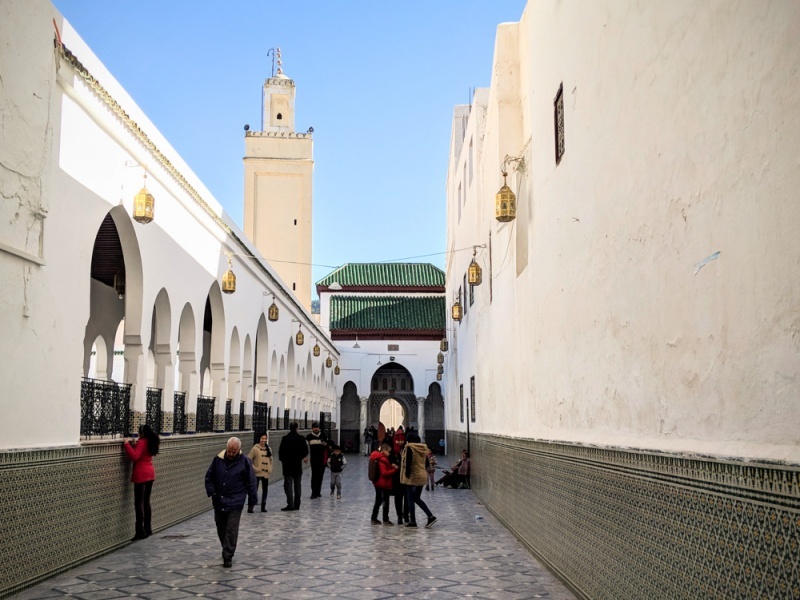 Non-Muslims are not allowed to enter the mausoleum of Moulay Idriss but it’s worth having a look inside the entryway which is located at the top of the main square. After checking out the entrance to the mausoleum you can get a birds-eye view from above. Look for either the “La Petite Terrace” or “La Grande Terrace” on Google Maps. Both provide spectacular views of the city from above but are a bit tricky to find. You’ll likely have a few people in town approach you to show you the way (for a tip of course) or you can try your luck navigating the winding alleyways on your own. Several restaurants in town have beautiful terraces with sweeping city views. Head to Scorpion House (by the same owner as Cafe Clock in Fes) or Der Zerhoune for a delicious dinner while watching the sun set. If you are looking for an inexpensive, simple dinner you can choose any of the restaurants lining the street leading to the main square. When you have finished exploring Volubilis and Moulay Idriss, simply reverse your route to return to Fes (or Meknes). 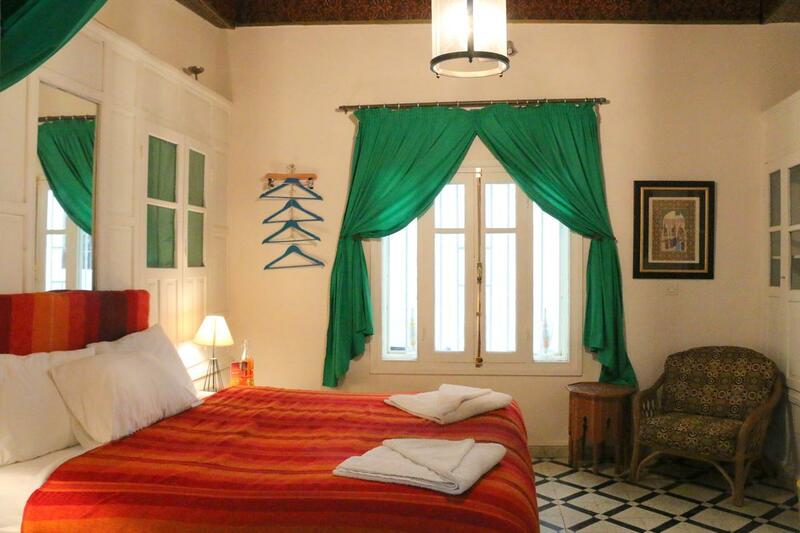 Dar Zerhoune is probably the best known guesthouse in Moulay Idriss. It boasts a rooftop restaurant providing sweeping views of the valley below. It’s right off the main square so you’ll be right in the middle of the action! Kasabah Senhaji also offers an outstanding terrace with lovely views. 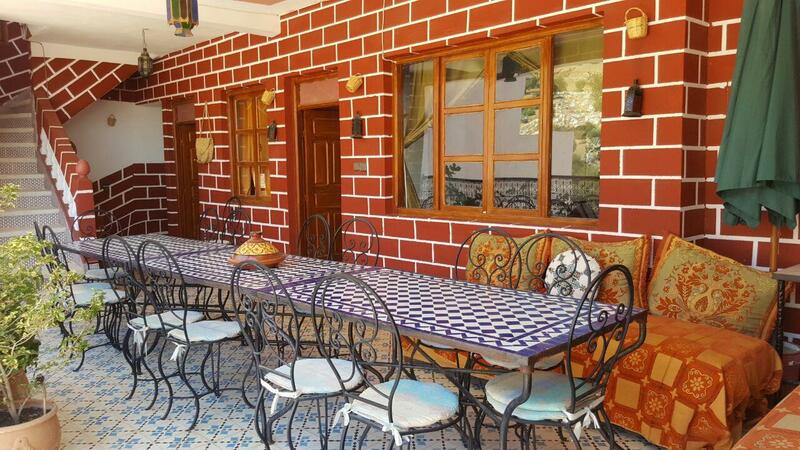 You’ll find the owner very welcoming and the food delicious! Hi Nick and Val, thanks for this nice informative post. This will come handy for us when we visit Morocco! Which month did you visit? Fields look green in your pics! Hi Pritz, so glad you enjoyed our post! We visited Morocco in January/February. Hi! Thanks for this post, it is really helpful. Me and my boyfriend are also planning on going to visit Volubilis and Moulay Idriss for one day from Fes in February. We prefer walking and I wanted to ask you if there are any signs how to get to Volubilis from M. Idriss? And in one picture I saw that Val are wearing gloves. Was it very cold or windy? Hi Ursa, so glad you found our post helpful! It would be easy to walk from Moulay Idriss to Volubilis. There are signs and there is really just one road out of town in that direction – so I don’t think you have to worry to much about getting lost. We were there in February and Morocco was actually quite cold. We even had a bit of snow while we were in the Atlas Mountains. 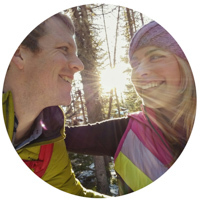 You’ll definitely want to bring along a jacket on your vacation and maybe a warm hat as well! Thank you for this excellent article. It helped us perfectly.